Every time I talk to people about PHEV/EVs, it doesn’t take long for the primary motivator to surface…Gas Prices…as the higher they go, the more people will consider purchasing a PHEV/EV. This was best exemplified over the last few years when the US saw large spikes in fuel prices: When gas prices jumped, so did the line of people at the Toyota dealership waiting to buy their Prius. Unfortunately, American’s are very short term focused (months or less). We like our fast food (1500 cal in 5 minutes), pharmaceuticals (why live healthy when you can take a pill? ), and quarterly earnings reports (buy/hold? yeah/right!). So it makes since that we remember the pain of rising gas prices only for the duration of the peaks in price spikes. 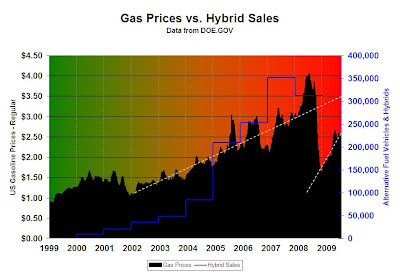 Once gas prices broke the $2.00 AND $3.00/gallon barrier in 2005, Hybrid sales jumped 150%...everyone knew what a hybrid was that year. On average, gas prices have risen 195% from 2002 to 2008 (before the recession took effect). Since the fall of gas prices in 2008, the price of regular gas has risen sharply and is on track to match its pre-recession price levels ($3.50) within a year. Given the current GDP growth rates of China (8% growth in 2009) and India (6.7% growth in 2009)…and their increases in per capita income, yearly increases in an unreplenishable resource (fossil fuel) are here to stay. …all we need to do now is not screw up the implementation!